Economize R$ 153,84 (25 %). Comprar eBook Kindle. Brazil is a globally vital but troubled economy. This volume offers comprehensive insight into Brazil's economic development, focusing on its most salient characteristics and analyzing its structural features across various dimensions. This innovative Oxford Handbook provides an understanding of the economy's evolution over time and highlights the implications of the past trajectory and decisions for current challenges and opportunities. The opening section covers the country's economic history, beginning with the colonial economy, through import-substitution, to the era of neoliberalism. Second, it analyses Brazil's broader place in the global economy, and considers the ways in which this role has changed, and is likely to change, over coming years. Particular attention is given to the productive sectors of Brazil's economy, for example manufacturing, agriculture, services, energy, and infrastructure. In addition to discussions of regional differences within Brazil, socio-economic dimensions are examined. These include income distribution, human capital, environmental issues, and health. Also included is a discussion of Brazil in the world economy, such as the increase in "South-South" cooperation and trade as well as foreign direct investment. Last but not least is a discussion of the role of the Brazilian state in the economy, whether through state enterprises, competition policy, or corruption. 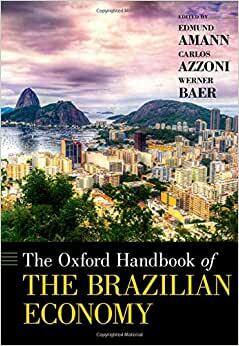 Comece a ler The Oxford Handbook of the Brazilian Economy no seu Kindle em menos de um minuto. Edmund Amann is Professor of Brazilian Studies at Leiden University. Previous to this he was Reader in Development Economics at the University of Manchester and Research Fellow at the University of Oxford Centre for Brazilian Studies. Carlos Azzoni is Professor of Economics in the Faculty of Economics and Administration at the University of São Paulo. His research focuses on questions of regional development and inter-regional disparities. Werner Baer was Lemann Professor of Economics at the University of Ilinois, Urban-Champaign. Prior to this he held a Chair at Vanderbilt University. Professor Baer's work focused on processes of economic development, industrialization and poverty alleviation.